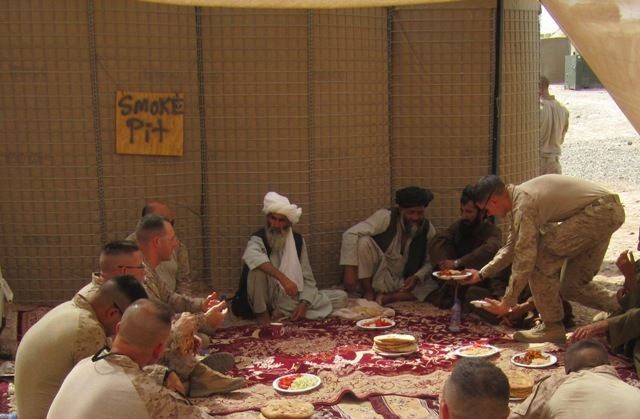 Patrol Base Boldak, Afghanistan — Much has been made of the deftness with which some Marine officers have been able to form productive ties and friendships with local tribal leaders in Helmand province. They meet in weekly “shuras,” or consultations, to discuss needs, problems and ideas. The tribal leaders get to report things that have happened as a result of the presence of the Marines, both good and bad, such as “your tanks rolled over my crop field,” (even though the Marines in this area don’t have tanks) and “we like you better than the British unit that comes down here.” The issues can sound the same week after week, but some progress can be made and it keeps the lines of communication open. Thomas serves food to the tribal leaders at the shura. 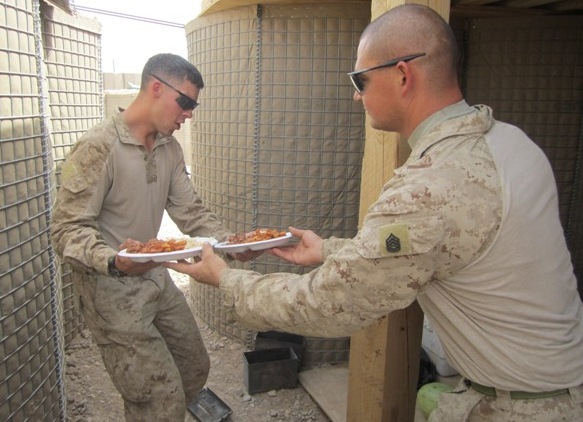 As hosts of the Saturday shuras at this small patrol base south of Camp Leatherneck, the Marines of Charlie Company, 1st Battalion, 23rd Marines, provide the food and serve it to the visitors and to their own. The “kitchen” is set up in a bunker behind the meeting area and the operation is as smooth as a rifle drill. 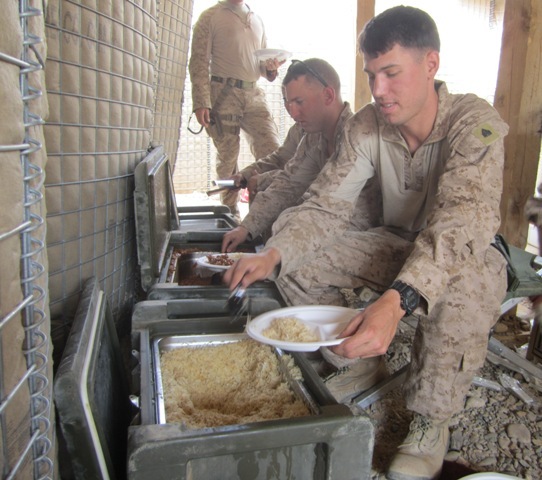 At a shura this past Saturday, Marines dished out hot rice, goat stew and fries from coolers; the plates were passed on to the gunnery sergeant, then on to the platoon commander who delivered them two at a time. He and another NCO also delivered stacks of bread and plates of lettuce and tomato. Dessert was watermelon, freshly cut with the five-inch blade of a folding Benchmade pocket knife. By 10 a.m., their grievances heard and pleasantries exchanged, the full-bellied tribal leaders’ sped off in their cars and mopeds. Rugs were rolled up and put away, and the shura area resumed its daily purpose – the smoke pit.